North Texas is home to a variety of soil types! Knowing your type will allow you choose the best plants to succeed in your environment. Your plants have a type! Or should we say….a soil type. Are your plant choices causing you more work than you intended? Blackland Prairie, Black Clay Gumbo, Sandy Loam- some common terms used to describe our North Texas soil. Get this….Texas is home to over 1300 soil types in 21 different soil regions! 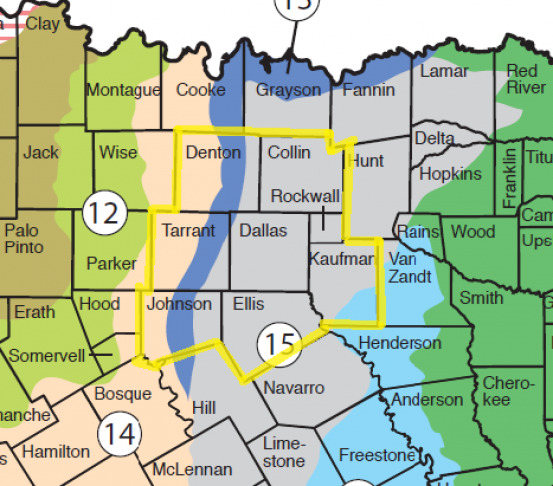 If you look at DFW highlighted in yellow, you will see that North Texas alone houses 3 different soil regions. The bulk of our Metroplex is in the grey colored area which is the Blackland Prairie. This area is made up of dark black to light grey clays. The dark blue area is called the Eastern Cross Timbers and it houses mostly sandy loam soil. Then, off the western border you’ve got the Grand Prairie which is a mix of clays, limestones, and some silty loams. Who knew how diverse we were here in North Texas! What do all of these soil types have in common? They are mostly alkaline meaning they sit above 7 on the pH scale. And….Why does this matter to you? Well, I suppose it only matters to those who love Azaleas, Hydrangeas, and Loropetalums (to name a few). All of these plants thrive in acidic soils. When you plant acidic soil loving plants in alkaline soils, the plants almost never perform optimally without proper prepping beforehand. 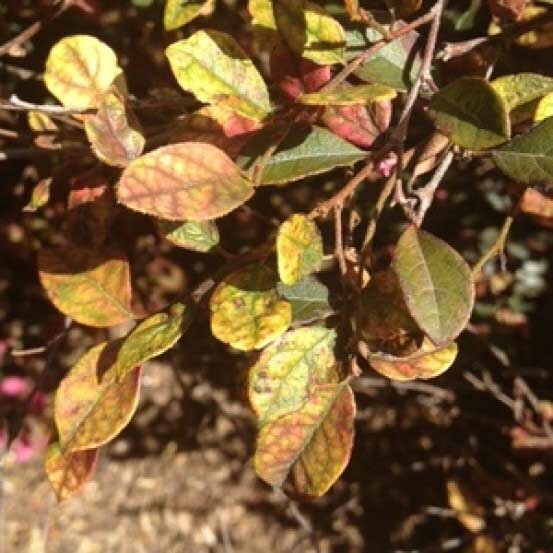 ​Picture shows a Loropetalum struggling from improper soil environment. Even then, the beds need to be redone every couple of years to maintain the longevity of the plants. Common amendments to lower the pH would be sulfur or peat moss. Either the homeowner can do this or any landscape company that does installations should be able to help. We can apply amendments to lower the pH but it’s only a temporary fix. In all honesty, we recommend choosing more alkaline soil loving plants to plant in your landscape. While this is the most practical solution, we understand that there are musthaves in your garden, no matter how much TLC they require! Check out this link for a comprised list of plants that thrive in acidic soils.